P1: At his first sight of the charging Martians, John Carter's muscles react strangely to the lesser gravity. P2: Tars Tarkas, the leader wishing to capture alive this jumping oddity, approaches in friendship. P3: There is no alternative but to accompany the giant warriors. "Better to be friends than enemies," Carter muses. P4: "These Martians are much too large for the doorways here. Could other humans be on Mars -- my size?" P5: To a gathering throng of curious Martians, Tars Tarkas describes in glowing terms his captive's great agility. P6: Tars Tarkas indicates that Carter should leap once more. A brutal fellow, in crude jest, trips the Earthman. P7: Drogar - The Mighty, laughs boistrously at his superb joke. P8: John Carter's fist crashes on Drogar's chin. "I am not amused!" the Earthman snarls. 2. "Drogar the Mighty" is an invention of JCB and will have to be somehow reconciled with the actual name of the first Martian that Carter killed (either "Dotar" or "Sojat"). Since Drogar does not have a double name, he cannot be an especially "mighty" warrior. Perhaps the name can be turned into disparaging title or nickname for the novelization, and his real name can be "Dotar." 3. Most of the Carter pages in issue #32 of The Funnies, are given over to telling about John Carter's rescue from the great white ape, by the calot Woola. This story is entirely missing from the Sunday strip, where Woola appears suddenly, without any accompanying explanation, in strip #3. In the novelization, the story of Carter, the Martian ape, and Woola can be reduced to a sentence or two. Later in the Sunday strip story Carter encounters another white ape, and in the novelization some minimal linkage of the two ape episodes can be made at that point in the narration. CHAPTER 2: "A GRIM SURPRISE"
Springing to his feet Captain Carter was surprised to learn that his every movement was magnified in the low gravity of Mars. A flick of the wrist sent his arm outward its full length. What would have been a three foot stride on Earth took him three yards or more in his new environment. He would have to learn to walk all over again, as the muscular exertion which carried him easily and safely upon his home planet played strange antics with him upon Mars. Yes, it must be Mars -- no other explanation seemed possible. The Earthman spent a considerable amount of time exploring his new situation. Sooner or later he knew he must find water and food. Clothing, weapons, and shelter might also be useful additions to his current set of possessions -- quick consisted of absolutely nothing. In his search he happened upon a low, walled enclosure about four feet in height, made of stones and some kind of cement. It had obviously been constructed by intelligent beings in the not too distant past, but the only possible commodity it might supply to meet his current needs was what appeared to be a nest of very large eggs. 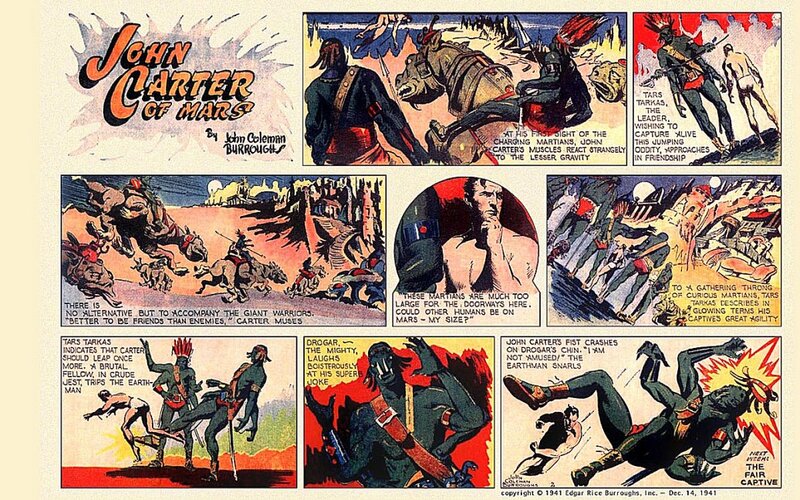 And, before he could examine this marvel very closely, John Carter met with the first of the many perils Mars. A score of sinister looking Martians almost took him unawares from behind. Coming, as they did, over the soft and soundless moss, they might easily have captured him, but their intentions were far more hostile. The rattling of the accouterments of the foremost warrior warned the traveler's ears and he spun around to meet the unexpected threat. For an instant the soldier from another world could scarcely comprehend the scene; it looked as if armed giants with a dozen limbs each were bearing down upon him. His mind quickly sorted out the details: they were huge, six-limbed creatures mounted upon even larger eight-legged steeds. They presented the picture rather like a dozen gorillas, each riding a rhinoceros and thrusting forward a great metal shod spear. At his first sight of these charging Martians, John Carter's muscles reacted instinctively. He leaped up to the top of the egg-filled enclosure. The full extent of his powerful jump did not end there, however. In the lesser gravity of Mars Captain Carter was able to vault entirely over the wide enclosure. This marvelous display stunned the savage green-skinned riders. They eyed him warily and exchanged strange sounds that Captain Carter guessed to be language. He was just about to continue his leaping escape when the Earthman noticed that several of the giants were pointing their long-barreled firearms directly at him. Running away no longer seemed to be a very good idea. fter the giants had conversed for a short time, one of their number dismounted, threw down his spear and firearm, and came around the end of the egg enclosure toward the Virginian, entirely unarmed and naked, except for a few ornamented straps which crossed his upper and lower torso. When he was within a few feet of John Carter the tall green creature performed a remarkable bodily transformation, going down upon four limbs and holding out his remaining two arms, palm first, as if to show that he carried no weapons. In Captain Carter's mind the monster looked very much like misconstrued centaur, drawn from a madman's retelling of Earth's mythological past. He accepted a metal armlet that the creature had unclasped from its own forearm and offered to him, but all the Earthman could give in return was a nod of acknowledgment and mimicry of the alien's open-palm gesture. That seemed to be just what the giant wished to see. He stood back up on his two rear limbs, voiced something like a gurgling laugh, and motioned to the white man that he should take a seat behind him on the glossy back of his mount. There the Virginian hung on as best he could to the Martian warrior's leather body harness and the entire troop galloped away toward the range of hills in the distance. Crossing over the hills the riders came down onto a low table land upon which the Earthman beheld an enormous ruined city. The savage caravan soon entered into this extensive collection of buildings and John Carter beheld, for the first time, evidence that the green giants might not be the only inhabitants of his new home. The riders were much too large for the doors, windows and alleyways of the ruined metropolis; all of which appeared to have been built by some other, smaller race. "Could other humans be on Mars -- my size?" questioned the Earthman. But the only intelligible sounds he could discern among the green man's grunts and roars were syllables that sounded something like "Tars Tarkas!" And that meant nothing to Captain Carter. As they entered the a plaza near the center of the city, hundreds of the twelve-foot creatures gathered around the riders, eyeing the white man suspiciously. By this time the Earthman had heard the sounds "Tars Tarkas" so often that he supposed it must be the name or title of his friendly captor. After the party had dismounted, this same green leader indicated by crude pantomime that the white man should give the giants a demonstration of his remarkable jumping abilities. This request Captain Carter complied with, giving some obvious satisfaction to the green leader and his people. After skipping around like some monstrous grasshopper for a while, the captive tired of the sport and ceased his frenetic activity. This did not suit the pleasure of one towering green man who stepped out of the crowd, yelling incoherent sounds like "sak, "drogar," and "gorthan-jur!" The meddler pushed forward, tripped the white man, and then proceeded to bang him about, all the while laughing boisterously at his superb joke. In a flash the Earthman sprang into the air, swinging a potent right fist squarely into the brutal fellow's jaw and he went down like a felled ox. The downed brute did not move a hair and Captain Carter thought it entirely possible that he had slain the giant antagonist with a single blow. This continued display of agility and conflict brought wild peals of laughter and applause from the giants and John Carter was left to wonder what sort of mad creatures he had fallen with. Surely they were a totally unpredictable and incredibly dangerous pack of monsters.